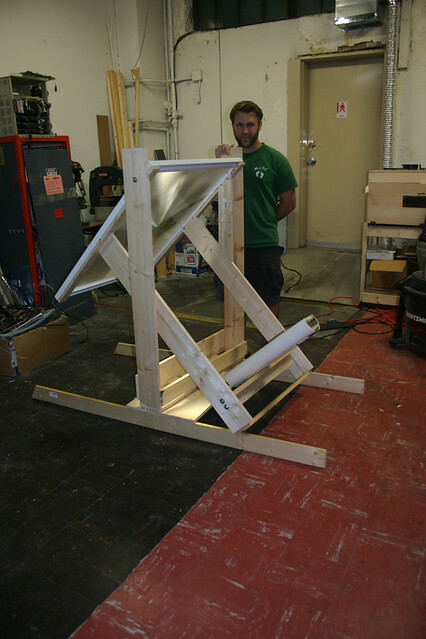 I've gone through quite a few iterations of the solar boiler. The current version uses a 47" Fresnel lens to focus sunlight down to about 1 square inch. The sunlight will focus on an evacuated tube that will transfer the heat into water. The aim is to boil the water and turn a steam engine, ultimately turning a motor and feeding clean energy into the grid. The solar boiler can now pivot in two dimensions allowing it the ability to track the sun as it moves from east to west from the morning until the evening and from north to south as the sun moves between winter and summer. The next step is to build in the tracking system which will consist of two stepper motors that will turn screws pivoting each of the two dimensions to follow the sun. We'll then tie in an MCU attached to some photocells to track the movement of the sun. After the tracker is built the boiler section is next. Honestly, I'm a little nervous about pressurizing steam. That episode of the mythbusters where they blew up the water heater has me a little on edge.